This article discusses the features and functions of the Production Schedule section located in the Details Tab of the DivvyHQ Sandbox, and the Task Tab of the Content Item slide-in. This section provides a basic list of the individual production tasks that have been created for a content item. If this area is empty, no tasks have been created for that content item. If/when tasks are created, you will see the "Done" checkbox, task title, user(s) assigned to the task (if applicable), it's deadline, and a Mark All as Done (tasks) link. In the upper right hand of this area, you can click Add New option to trigger the Add New Task overlay. It's a good idea to think about the various steps or tasks that will be required to produce, review and approve your content item. 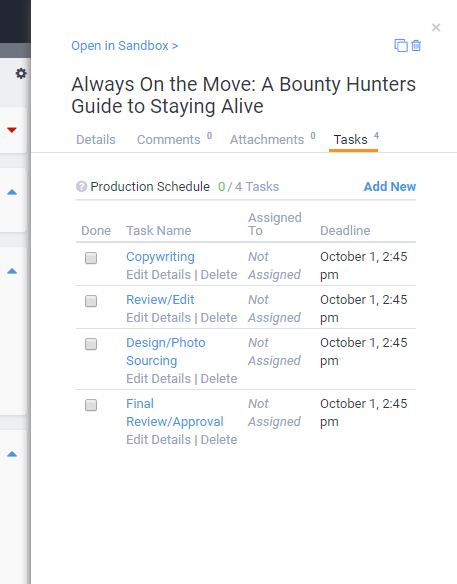 Creating tasks and assigning them to members of your team will aid in accountability and give you a quick glimpse of where a content item currently sits in your production process. 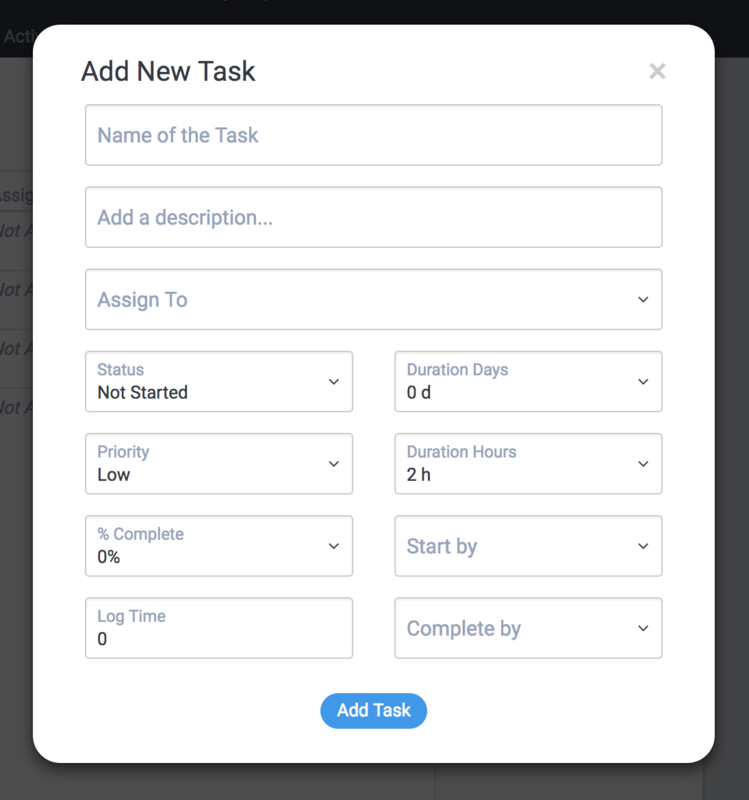 To make things a little easier on you, when adding a task via the sandbox we will auto-order it among the other tasks, based on its deadline. To edit the details of a task or add a comment to a task, click the Edit Details link under each task title. An editable form will slide out from the right and enable you to make and save changes to the task. Have a task that didn't get done by its initial deadline? Or got it done early? Well Divvy can help make sure your future tasks get their deadlines updated to match the change in workflow. If you have a task that needs to have its start by or deadline date updated, simply open its task slide-in in edit mode and update either the start by or deadline date to your liking, then click within the task slide-in to force both deadlines to sync their dates based on the task duration. Click save within the task slide-in to save the updated task start by and deadline dates. After doing so, an overlay will show asking if you want to update task deadlines (or not). If you decide to update future task deadlines, you will be presented with a second overlay asking if you want to change the content item deadline to match the last task's deadline. For Enterprise and Pro customers, custom workflow templates can be configured, which automates the creation of production tasks. 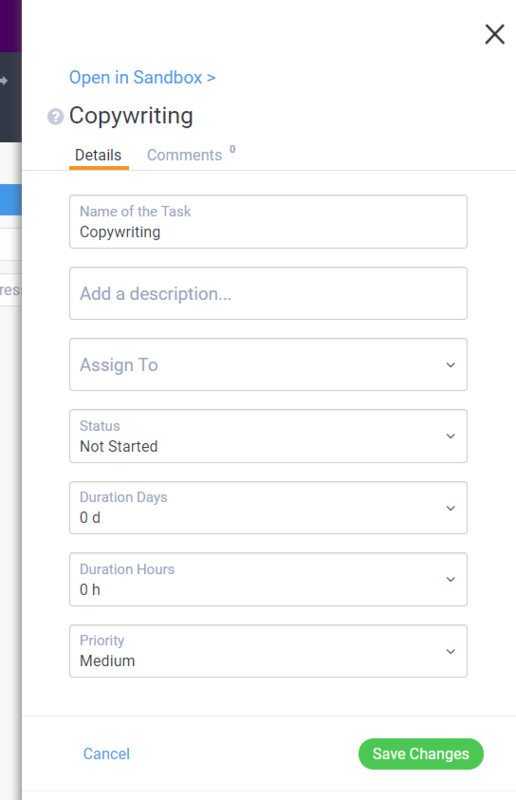 If a workflow template has been pre-configured for your content item, you'll notice that the Production Schedule area will auto-populate with the tasks specified in the workflow template. In addition, adding a final deadline on the content item will auto-calculate the individual deadlines of each production task.